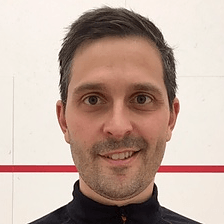 Just starting a page for Head squash strings. This comes in 18 and 20 (?) gauge. I’ve seen this in 18 gauge only. They also have a tennis string by the same name, in larger gauges. 1.25mm, 17g with multifilament Zyex core ! sounds equivalent to the Ashaway ZX series ! The Ashaway ZX series do not have a Zyex core, they have a nylon multifilament core. Thanks for the tip. totally agree with the Ultranick thing ! for marketing purposes, HEAD should come up with a different name. Sometimes releasing new colors of same product would be enough to increase the sales ! Head is great ………. 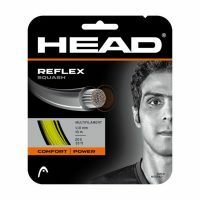 when using Head-string on a Head racket, I suppose. I’m playing Head from 2002 (only) and the standard fabric string lasts two 2 three weeks (sorry). So, now – after 2 years of R&D with my local supplier – i’m playing with 2 different strings (Babolat & Pacific – 1.3 mm and 1.6 mm) with different strength (10,5 & 11, 5 – in kg’s – in lbs +/- 23 & 25). 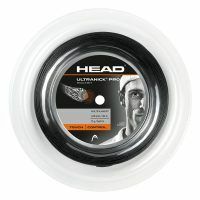 It gives the same effect as the Head-fabricstring but now it lasts 3 months till breakdown. The conditions: perfect ‘trampoline’ for lessons ….. and control & hard balls for competioning play. 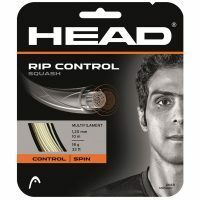 As a Head fan – now playing the PDHsports (UK) Head Stealth 110 – I’d like 2 try this string and like 2 contact youre Head contact 4 European/Dutch possibilities because the dutch market is overwhelmed with marketingstrings (Dunlop, Technifibre and other I don’t even want 2 try) and don’t reached the/my current stringlevel. Every (strong) Ashaway went down in strength after 3 weeks and broke 2 weeks later. Excuse my French – I’m Dutch. It’s not uncommon to have durability issues with strings in rackets that have an open string pattern like the Head Stealth 110 (12M x 17C). With those kind of open string patterns, I don’t think it is wise to use multifilament strings with gauges lower than 1.20mm. Based on the gauges you are mentioning (Babolat & Pacific – 1.3 mm and 1.6 mm!?? 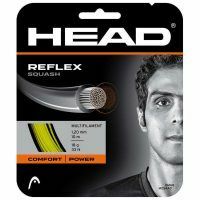 ), it looks like your local supplier has come to that same conclusion and has burdened you with a set of tennis strings. I’am not sure if that’s the way to go. So ashaway should relabel their 1.05 string and make gauge 21.